1: Built-in high-capacity lithium-ion battery, DC5V charge. 2: Support MP3 music player, support Bluetooth connection. 3: After the Bluetooth search device is turned on, the connection will be paired. 4: After successful pairing, Bluetooth will indicate that Bluetooth is connected. 5: Support mobile audio Bluetooth transmission to audio playback music, support the use of Bluetooth answer calls. POWERFUL & CLEAR SOUND BAR FOR TV: Maximum 80 dB surround sound covers over 300 sq. ft. The soundbar provides crystal clear sound with dual high quality surround sound speakers and unique anti-noise technology. WIDE COMPATIBILITY: Equipped with the latest 4.0+ EDR Bluetooth technology, the Soundbar can stream every detail of the sound from your Smart TV, smartphone, tablet, and laptop just in one touch. ★ MULTI-MODES SPEAKER -It use 3.5mm line-in jack, also support external audio devices, allows you to stream music to your other devices.Tips - If you want to connect this speaker with your TV, pls make sure your TV with 3.5mm Aux hole or TV with lotus interface audio output function. It also support TF Card mode, enjoy your favorite music from your TF Card. FIT FOR MOST ELECTRONICS:The surround soundbar system fits for most electronic devices with audio players, including TV, pc, notebook, smartphone, tablet, MP3/MP4 and CD/DVD player. 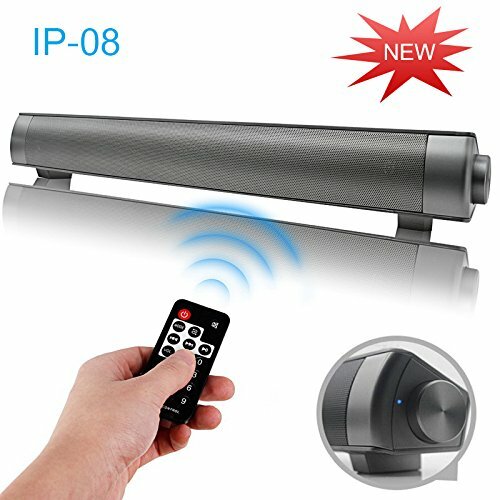 【100% SATISFACTION GUARANTEE】:Geelyda bluetooth sound bar has a 100% Satisfaction Guarantee and 360 days warranty. is committed to delivering an excellent experience for all buyers. If you have any questions about this product by Geelyda, contact us by completing and submitting the form below. If you are looking for a specif part number, please include it with your message.